I had the pleasure of conducting the premiere of my first beginning band piece The Kings March this afternoon. The piece was written for the Kings Glen Elementary School band and was played by the combined fifth- and sixth-graders; over 200 kids! I have always loved writing music for younger players, but this was the first time I had written for first-year musicians. It was a challenge, but I think I succeeded in writing something that was compositionally sound, had educational merit, and most importantly, be actually playable! For other composers out there, I can’t recommend writing for kids enough. Every time I saw one of the students from Kings Glen, either from my visits to the school, or just at the neighborhood pool, someone has come up to me to thank me for writing the march for them. They are so grateful and excited! No matter what the grade level, students take enormous pride in performance when they feel that sense of ownership. Thanks again to Kelly Stratil and the fantastic students of Kings Glen Elementary! Let’s go band!! Okay, this post is way late and I’m going to backdate it, if WordPress will let me. It’s my blog and I can do what I want. No one’s reading anyway. How surreal is it that only the second performance with a new ensemble is in front of the members of the highest court of the land, and that you’ve programmed your own music for it? People will think I’m a raging egomaniac. I’m really not, but why not be proud of what you do? We sang my new arrangement of ‘America the Beautiful’ among other things at a dinner in the great hall of the Supreme Court building. This in celebration of the end of the court session. Wish I had pictures but didn’t have the opportunity. Or a camera for that matter. No worries, there are pictures of me conducting the band on the steps of the capital! Those come soon! Two days ago I received notice that Black Tie Blu-bop didn’t win the NBA/Merrill Jones Band Composition Contest and that my submission would be returned under separate cover. Fine. But today I get a letter from Frank Wickes saying that the committee thought my piece was “excellent” but exceeded their Grade III/IV requirement (an accurate assessment–it’s a solid Grade V). So he forwarded the score and CD to Wingert-Jones for publication consideration even though the piece didn’t win! What a classy thing to do; I sent a quick email of thanks. W-J should have a look in a month or so. Even if it doesn’t get selected, it was a meaningful gesture from the judges not to simply throw out the piece as ineligible. This good news led to a friendly call to Dave McKee (Virginia Tech marching band and symphony band director, and good friend), who said that Grafton High School‘s performance at VMEA was fantastic. It totally slipped my mind! Hopefully Darren will come through and get that recording to me. Though I haven’t been productive, I’m still at least trying to write. I figured I would be able to write a lot of music while I didn’t have the distractions of home during the course, but I was mistaken. I talked with my wife earlier and I think she’s right: I have the time to write, but without the immersion in and exposure to a musical environment, I’m not getting anywhere. Note to self: never apply for the Rome prize; you’ll only waste everyone’s time. At least I am nearly done with my woodwind quintet and there will be much rejoicing when it’s finally finished. I don’t see another one in the forseeable future. I haven’t posted anything new for a couple of months because a) I was overwhelmed with all the tasks involved in moving your family and all your stuff back from three years of living overseas, and b) there wasn’t anything to report anyway. Galaxy Portals was not a winner of the Dallas Wind Symphony Fanfare Competition this year, but I still think they’re a pretty good band (wink). But some good news has come my way recently–the Grafton (VA) High School Band will be performing Black Tie Blu-bop at the Virginia Music Educators Association In-service Conference in November! Their director, Darren Kirsch, is an old Virginia Tech classmate of mine. I am looking forward to meeting and working with his band sometime in the very near future. Unfortunately, I will not be able to attend the performance itself, but I am honored and excited that my piece is getting out there! Anne and I went to see the Berlin Philharmonic this past weekend. When I saw that they were performing ‘Petrushka’ and Mahler’s Symphony No. 1 (two pieces I studied in college), the search for other anniversary destinations was over as far as I was concerned. Thankfully, Anne agreed. 🙂 Of course, the orchestra played fantastic, but I marveled at some other aspects of the experience. The concert was completely sold out, as apparently all of them are, but when they say sold out, they mean sold out. Every seat was filled; there were people standing in the back of the hall, and people sitting in the aisles. It was as packed as a State-side hockey playoff game. Dress ranged from suits and formal dresses to jeans and t-shirts. The young people looked like they would hit the clubs afterward. At the end of Petrushka, the crowd applauded enough to bring the conductor back to the stage three times. This was for Stravinsky. The conductor returned for four curtain calls–the last one after the orchestra had left the stage, the house lights had come up, and half the audience was home. 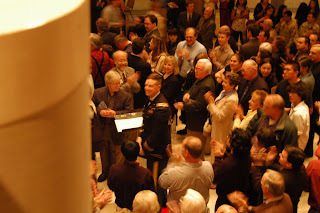 And now, only a month late, are some pictures from the Fanfare for Enduring Freedom performance. A family vacation covering four countries on two continents has precedence on maintaining a timely website, not that anyone’s reading this blog anyway (except you…hi, Mom!). 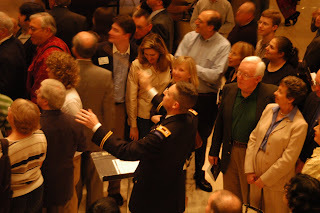 So, the above picture is of course me conducting the piece. Below is a shot to give you an idea of how far away the musicians were up on the balcony. And finally my smiling mug afterwards. It really was a neat experience. The concertgoers in Dallas were gracious and kind; a class act. Finally, it’s been a week since the Virginia Tech shootings, and let the record reflect that of course I will write a piece. That took all of a couple of minutes to figure out. Decision number two (whether the piece would end on a somber or triumphant note) was decided after Nikki Giovanni’s speech at the convocation. The students’ reaction (to cheer “Go Hokies Go”) sealed the deal. Never have I been so proud to be a Hokie. As it turned out, I did conduct it, and it was an unforgettable experience. The night before the concert, there was a rehearsal to go over the combined pieces (DWS and Field Band) and the fanfare. The brass choir was comprised of both groups as well–forty players. 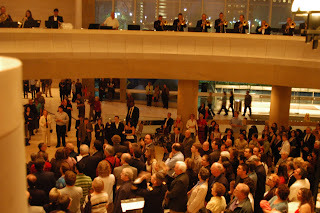 After the rehearsal, one of the Dallas trombones said that he thought the piece would be the “best ever.” The DWS has been playing fanfares before their concerts for nearly ten years now, but they are played in the foyer of the Meyerson Symphony Center where the acoustics are extremely live. That is, it’s made of marble and glass, and the sound just reverberates forever. I just lucked out that my piece with its slow tempo and chorale was ideally suited for the room. Conducting some of the finest brass players in such a loud space was a trip, but it didn’t match the reaction of the audience. I started shaking hands almost immediately with thankful concertgoers (and one woman really did say that my fanfare was the best of all she had heard in the years she had followed the DWS). What a kind, appreciate crowd. John Gibson, resident composer of the Dallas Wind Symphony, also had nice things to say. It’s always reassuring to be recognized by fellow professionals. Many thanks to the DWS staff especially Kim Campbell, John Mahood, and Courtney Dodson for their hospitality, and of course Jerry Junkin and the Dallas Wind Symphony, and COL Finley Hamilton and the US Army Field Band for their fantastic musicianship and talent! This past weekend was the Virginia Tech Honor Band Weekend and what a great time it was! I really enjoyed meeting up with old classmates and new friends. It was great to see so many familiar faces and to catch up on all the gossip. I arrived on Thursday to speak with the music education students about careers as a military musician and right after that there was a small reception. I should have figured out right then and there that this weekend would turn out to be something special when I saw the cake. The ‘Golden Hokie Honor Band’ gave a terrific first performance of ‘Black Tie Blu-bop,’ which was written especially for them. I think the piece was well-received by the audience on Saturday night, but most importantly, it was a hit with the young musicians themselves. I set out to write something challenging and fun, and I think I succeeded even more than I had dreamed. Thanks to all who spoke with me and shared your kind comments! I’ll admit, though, that I should have asked more questions earlier in the discussion phase–who knew this band would be a hundred strong? My sincere thanks to all students, teachers, parents, and administrators of the tenth annual Virginia Tech Honor Band Weekend, especially Dr. Patrick Casey, who conducted the performance, and Dr. David Widder, for whom the piece was dedicated. I am already looking forward to my next visit!